When Hobie introduced the Pro Angler 14 I remember looking at the sheer size of the kayak and dismissed it as being obscenely large and not particularly practical as a fishing kayak. Looking back, those views were somewhat narrow minded and focused around my own fishing requirements and experiences. In August of this year I spent a week kayak fishing in Florida and had the chance to check out the Pro Anglers up close and personal. My views were still unchanged, I still considered it a beast and I couldn’t take it seriously. I was then selected to represent Hobie Team GB at the Hobie World Championships in Texas in November this year. Hobie were of course providing the kayaks for the event and they’d were to be in the form of Pro Angler 12 kayaks!. The thought of fishing the World Championships was an exciting one, though fishing from a Pro Angler wasn’t quite having the same effect. November arrived and I met up with the other two members of Hobie Team GB and be flew out to Texas. Twenty four hours later I was introduced to my trusty steed for the event, the Pro Angler 12. To be honest it was the first time that I’d really looked very closely at the Pro Angler, I had little choice to be honest!. I looked over the kayak from bow to stern and was quickly up to speed on the rudder controls, the seat, mirage drive, front hatch, battery pack, etc. Once I started throwing my rods and tackle aboard it suddenly didn’t seem so big. The trolley was fitted with the aid of another competitor, though this could still be easily achieved single handed by rolling the kayak onto its side. Anyway, to cut a long story short, by the end of the tournament my views regarding the Pro Angler had changed considerably, it was indeed an excellent fishing tool. Yes, it has some limitations and drawbacks (doesn’t any kayak? ), though as a fishing kayak it excelled in the conditions that I tested it in. I decided to produce a basic review of the Pro Angler 12 which can be read below. Oh, let’s make no bones about this, the PA 12 is a big and heavy kayak!. It’s designed with stability and comfort in mind and in these areas it excels. All areas of the kayak are easily accessible when afloat and standing whilst fishing is no problem whatsoever. The few days I spent fishing from the PA 12 I was regularly accessing the front hatch, the livewell, standing to cast, etc. I was initially quite concerned with how the PA12 would fare in choppy water. This wasn’t an issue for the first 3 days I fished from it, however, on the final day’s fishing the wind blew up and the water was quite choppy with a steady swell pushing through the lake I was fishing. At first I felt quite uncomfortable, this was due to the higher seating position creating a greater movement as the kayak rolled in the swell. I soon adjusted and realised that the PA 12 was quite happy in choppy water or a rolling swell, even side on. The photos below show the PA 12 with a livewell loosely fitted (not plumbed in), note, the Mirage Drive is not fitted. My biggest concern with the PA 12 was moving it around on land, though with the trolley fitted it’s no different from any other kayak. Sure, it’s easier to fit the trolley using two people, though one person can easily roll the kayak onto its side and the trolley can be inserted and the kayak rolled back. The biggest issue with the PA 12 is transportation. With a large flatbed pickup it’s not an issue, the same goes for a low level trailer. However, roof mounting a PA isn’t quite so easy!. There are videos on You Tube showing how people have overcome this potential problem, though it’s still probably best achieved with the use of two people. A real selling point of the Pro Angler kayaks is the Vantage seat, it really is a fantastic piece of kit!. This deluxe chair is designed with Hobie's new comfort-mesh for breathability. It can be adjusted for height as well as tilt on both the seat back and seat base with a simple twist of an arm rest. Adjustment whilst afloat is quick and easy in all respects. The integrated Boa System allows for ultimate lumbar support via one-handed dial adjustment. The seat will fold up out of the way for stand-up fishing if required. The seat is also easily removable for use on-shore use should you want a chair for camping or just relaxing whilst ashore. I tried it in both the low and high positions, though I preferred the lower seating position. This is possibly due to the fact I’m just used to sitting low in a kaya. Perhaps if I’d fished for a much longer period I’d have moved up to the higher setting. This is the most adjustable and comfortable seat that I’ve experienced on a fishing kayak. The front hatch on the PA 12 is big and can swallow large amounts of gear. It is supplied with a removable liner (not shown) which I found quite handy as it allowed easy transportation of tackle to and from the kayak. I’d not normally access the front hatch of a kayak whilst afloat due to the inherent dangers of such a manoeuvre!. However, the high stability of the PA 12 makes accessing the front hatch whilst afloat both easy and safe. Opening the front hatch is a simple affair, release two bungee cords and you’re in. I had some fun on my final day fishing from this kayak, powering through some choppy water. Despite plenty of water coming over the front hatch, there was no problem with water ingress into the kayak. The PA 12 has a sail mount allowing use of the optional Hobie sail kit, though it’s not something I’ve tried to date. If you want to see the PA 12 under sail you can view a video on You Tube be clicking >>here<<. The PA 12 has the facility to store up to four 7’ rods horizontally whilst afloat (the PA 14 stores up to six). It’s a simple case of inserting the rod tips into the tubes just behind the front hatch and lying them down next to the seat. They can then be secured in position with retractable bungee cords fitted to the ‘mid-ship’ handles. At the time I had a livewell fitted so I tended to store the rods vertically in the livewell rod holders in order to keep the kayak foot wells clear. That said, it’s a very handy facility to have. Moving onto the cockpit area. As can be seen in the photos above and below the working area is large and flat. The cockpit floor is dominated by the Mirage Drive mounting hole. The Mirage Drive on the Pro Angler is fitted with the upgraded Turbo Fins as standard. Fitting and removing the Mirage Drive is quick and easy, taking only seconds. The PA 12 is also supplied with a two piece paddle and T-handle which can be used when the water is too shallow to allow effective use of the Mirage Drive. The photo above show the presence of two replaceable mounting boards which are ideal for mounting fish finders, cameras and other accessories. Track systems such as YakAttack’s GearTrac systems are also easily fitted. There are also two large grip pads fitted to the cockpit floor to aid standing. The storage facilities continue with the presence of a large ‘twist & seal’ storage compartment in front of the seat which holds Plano style lure boxes. The box holding mechanism can be removed if required to allow a large opening into the kayak. The rudder on the PA 12 is a retractable affair, lowering and raising the rudder is achieved single handed using a lockable pull cord on the right hand side of the cockpit. The steering control can be positioned on either side of the cockpit to suit the user. Initially the rudder control seemed overly sensitive, though I soon adjusted to it and I found the PA 12 incredibly manoeuvrable for such a large kayak! There are yet more storage facilities as you continue aft with small nets either side of the seat and storage for up to two large Plano lure boxes beneath the seat itself. There’s also a flat area either side of the seat which I found particularly useful for placing odds and sods whilst fishing. Multiple pad eyes are fitted around the seat area which can be used for clipping accessory leashes to the kayak as required. As can be seen from the photographs below, the front and rear of the kayak feature oversize lifting handles, as well as two drain holes positioned below the rear lifting handle. The draft of the kayak was surprisingly small considering it’s overall size, this enabled it to venture into very shallow water without any real issues. Consideration has to be given to the Turbo fins with regards to damage when in shallow water. ‘Feathering’ the drive to minimise fin movement still allows the PA 12 to progress forwards whilst minimising the chance of damage to the fins. The rear tank well area is huge and I positioned a livewell into the tank well (not plumbed in) to provide an idea of the size. There’s a large 8” ‘Twist & Seal’ hatch on the bed of the tank well that provides access inside the hull as required. There are also two capped vertical moulded rod holders angled for trolling (visible either side of the livewell). 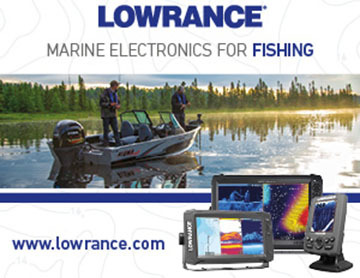 A Lowrance-Ready built-in transducer mount features pre-installed through-hull cable plugs. 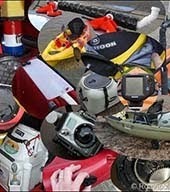 Fish finders can be installed in minutes without gluing transducers or drilling holes in the kayak. So overall I was surprisingly impressed with the PA 12 as a fishing kayak, it’s fair to say that is exceeded my expectations in most areas. Yes, it has it’s drawbacks, it’s large, heavy and is affected by strong side winds. However it’s perfect for sheltered venues, both fresh and saltwater. I’ve heard those who say that they wouldn’t take the PA12 to sea, I would, though I’d avoid surf and rough water in windy conditions. It ideally needs clean launch areas and if car topping the kayak, assistance or good loading technique is a must. The PA 12 was surprisingly fast for such a large kayak, even when peddling into a head wind the performance of the PA 12 was hardly affected. I found myself looking over to areas of the lake that (considering the wind and chop) I’d not have bothered to paddle over to in my Prowler Big Game. However, I didn’t give it a second thought in the PA 12, difficulty in covering distances was not an issue that I experienced. I’d probably not recommend the PA 12 as a great all round kayak, it’s let down by its sheer weight and size. However, it’s those ‘attributes’ that allows it to excel as a fishing platform in more sheltered waters. The Pro Angler 12 can be seen and ‘test driven’ at the Hobie Centre in Poole, Dorset. Nice review Rob. I own a Revo myself and a huge advocate of the Hobie range with my selection working well from a self car-topping and offshore trip in swell perspective. I do love the look of these on the water though and would certainly consider it at the top-end of my list if i primarily fished the calmer waters of lakes, estuaries, and rivers. Be interested in your thoughts following a trial in a Revolution or Adventure should the opportunity arise. What this space, I'll be testing and reviewing more Hobie fishing kayaks in the near future. 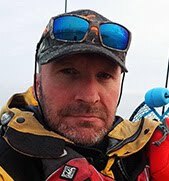 I have followed your blog for nearly two years and it was as a blog should be a personal account of your fishing trips and a personal account and reviews of the equipment you use and it has been excellent. 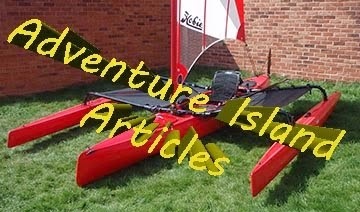 However, it now appears to be becoming a Hobie Kayaks and Hobie Equipment Blog whether you actually intend to use it in the UK or not for example plans to review other Hobie kayaks that you will probably never use in your own fishing. Maybe this is a condition of sponsorship from Hobie? Please lets get back to doing some actual fishing and customising the kayak you actually intent to use in UK waters. Hi, thanks for your comment. The lack of fishing reports is down to a lack of fishing due to personal circumstances, however, that will change very shortly. I've kept myself ticking over by publishing some reviews on gear. Yes, I am sponsored by Hobie, however I'm under no obligation to publish product reviews, it's my own choice to do so. I've made it very clear to my sponsors from the outset that it's highly likely that I'll publish product reviews and that I'll be totally honest with regards to my opinions. I've published many product reviews over the years and I'll continue to do so. 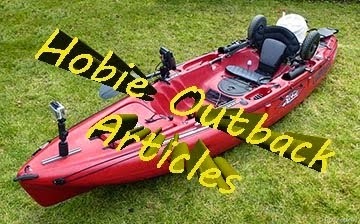 As I'm sponsored by Hobie I do of course get my hands of many Hobie products and over time I'll review some of them. With regards to the Pro Angler 12, I fished intensively from it for 4 days and was therefore in a good position to give an honest review. The fact that I don't own an PA12 is no reason not to publish a review on it, potential owners out there surf the internet looking for reviews to assess opinions prior to purchasing a product. I've spent many hours researching reviews and I feel that by publishing my own reviews that I'm putting something useful back into the system. With regards to modifications and rigging I have articles coming up soon covering my rigging and associated modifications on my Hobie Outback, a job that's finally very close to completion!. I'll also be publishing reviews on some Daiwa tackle and Lowrance electronics as well as some DIY projects. Great review Rob! Wait until you try an Adventure, you'll feel the need for speed. That being said a PA12 would be nice in the stable too. Cheers. 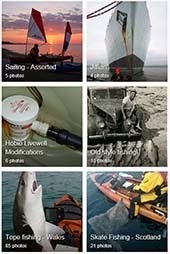 I found this very helpful, as a newer kayak fishermen I have been attempting to determine which peddle kayak would be best for choppy ocean water. Before this review I assumed the pro angler would be very good for this, seems like no it would not be best? Would you mind explaining a little bit about what dimensions/ features make the best open ocean kayak?